Birds of Tawharanui is a checklist of birds, see how many you can spot at the park! The Tawharanui Open Sanctuary project was initiated in 2000 following interest from the community and within the Auckland Council to establish an intensively managed conservation program within a regional park. Tawharanui Regional Park was selected because of its size, its location at the end of a peninsula, the range of habitats present and its proximity to significant conservation areas such as Hauturu (Little Barrier Island). 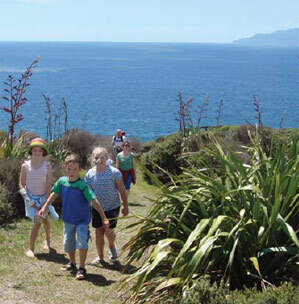 Tawharanui Open Sanctuary program makes a major contribution to public education, recreation and biodiversity conservation. It provides a unique educational and recreational opportunity for school groups, campers and special interest groups. Fourteen species have returned or been added to the Park since the program was commenced and the Tawharanui Open Sanctuary plays an important role in regional and national threatened species programs. Tawharanui Open Sanctuary is the subject of numerous research projects on the ecology and management of threatened species in association with universities, DoC and other research groups. The partnership between TOSSI and the Auckland Council is a model for government/community relationships.